“You should have seen the eyes light up around the conference table when we announced in a staff meeting that NRF was going to be getting its own beer,” recalls Nora Simmons, communications director for NRF. For the outdoorsy staff at NRF, marrying great beer with philanthropic support for the great outdoors is a match made in heaven. Joe Goldfine from Octopi Brewing and Steve Blevins from 105.5 Triple M will tell you that The Giving Brewery beer is made “for the thirsty and thoughtful”. After working with them, it’s easy to see that this beer is also made by thoughtful companies that are embodying a culture of giving back. The Giving Brewery is a partnership between Octopi Brewing and 105.5 Triple M. Together they create and market exceptional craft brews that support different nonprofit organizations like the Natural Resources Foundation. 105.5 Triple M and Octopi Brewing, work together to find a charity partner, come up with a beer and then market the product to raise awareness for the charity benefiting (all profits are donated to that charity). 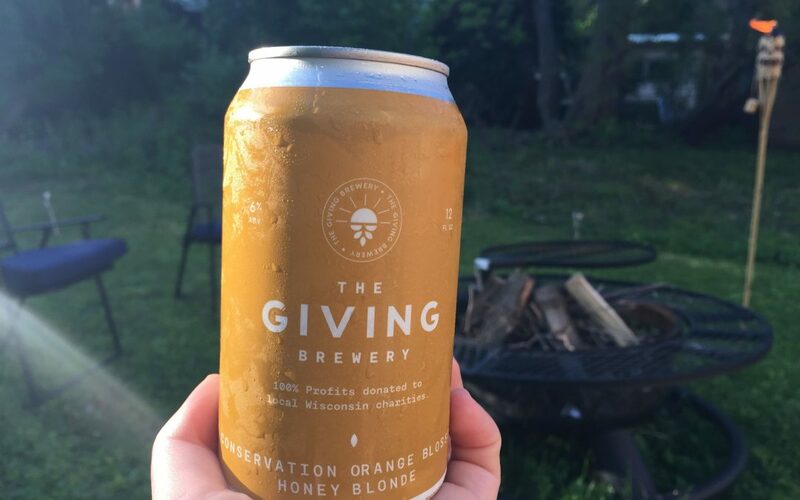 NRF collaborated with The Giving Brewery to create Conservation Orange Blossom Honey Blonde. This summer we had a tapping party to promote the beer (watch the video below to see how it went). The funds raised from this effort will be used to support NRF’s mission to connect generations to Wisconsin’s lands, waters, and wildlife through conservation, education, and giving. How did The Giving Brewery start? The idea for The Giving Brewery was born in the spring of 2017. Later that summer, The Giving Brewery put out its first beer — The Road HoMMMe — which was so successful they decided to grow from selling kegs to selling cans and bottles, while also reaching out to more nonprofits. The idea behind The Giving Brewery is the importance of giving back to the community. Instead of simply donating a check, Octopi and 105.5 wanted to create a bigger way of giving back. Joe said it’s been exciting to work with different initiatives he wasn’t aware of before. Steve said that was also a goal they had for the first year — to confront issues across all realms of society by identifying needs like homelessness and conservation and then trying to make the biggest difference. What’s next for The Giving Brewery? The Giving Brewery will collaborate with two more nonprofits this year: The Second Harvest Foodbank of Southern Wisconsin, a charity combating hunger, and Fetch Wisconsin Rescue, a dog rescue organization. “We’re trying to find new ways to grow, better ways to help out, and get more people involved,” Steve said. NRF’s collaboration with The Giving Brewery has been quite successful thus far. Joe said the Conservation Honey Blonde has done exceptionally well. It’s been quite popular with NRF members and sold out of many distribution locations within weeks of launching. “Working with the Natural Resources Foundation and Camille and the rest of the folks over there was just fantastic,” Joe said. We couldn’t agree more. Cheers to Conservation! Post contributed by Hibah Ansari, communications and programs assistant. The Natural Resources Foundation is a proud supporter of Green & Healthy Schools Wisconsin, a program that empowers, supports and recognizes schools for nurturing healthy kids and sustainable communities. All of this beautiful snow here in Madison reminds me of a winter trip I took to northern Wisconsin, when I had the opportunity to explore a new place: Germain Hemlocks State Natural Area in Oneida County. Every Monday during the school year, nearly 75 students and volunteers with Project Wild Child pile into buses and travel to the nearby school forest for the day. Transportation to the school forest has been made possible for two years in a row thanks to the Foundation’s Go Outside Fund and Teachers Outdoor Environmental Education Fund. Devil’s Lake State Park is one of the most highly visited and cherished public properties in Wisconsin. Funding from REI was used to complete critical restoration activities. We have 36 species of reptiles in Wisconsin and more than half of them are listed as endangered, threatened, or a species of special concern. These animals are vulnerable and critically important to the health and balance of our ecosystems. The Natural Resources Foundation of Wisconsin has awarded $28,043 to 30 organizations across Wisconsin through the C.D. Besadny Conservation Fund. The fund annually awards grants up to $1,000 that support grassroots conservation and education projects. The Natural Resources Foundation helped fund trip for seventh graders from Phillips Middle School to Isle Royale. Students learn about renewable energy, environmental stewardship, earth science, and history as well as picking up the basics of camping and leave-no-trace ethics. Spending time in nature has a physiological effect on the body, reducing blood pressure and the hormone cortisol, which is associated with stress. Thus, our time in nature serves to lessen stress and refresh our brains, improving focus, creativity and problem-solving. Faville Prairie is a highly diverse prairie with over 200 native prairie plants, but in recent years, invasive shrubs and trees have invaded the remnant prairie resulting in a loss of native species diversity. With support from the Natural Resources Foundation, the Arboretum worked with Tallgrass Restoration, LLC, to remove about eight acres of invasive shrubs and trees as part of a prairie restoration at Faville Prairie SNA. The Natural Resources Foundation’s kestrel banding Field Trip is a long-time favorite. These trips are so popular that it can be hard to get a spot. Fortunately, one incredible Field Trip participant put together an amazing slideshow to share his experience. Join thousands of people who receive monthly updates on Wisconsin’s lands and waters. Help support our cause by giving a gift or by joining us!